The pre-releases are done but our drafting and sealed events are just beginning! Sorry I wasn’t able to get all of the articles done on time (again), but hopefully you’ll still be able to get a lot of use out of the remaining ones. I have a few sealed PPTQs coming up, as well as Grand Prix Nagoya in January (which is Oath/Battle sealed), so I’ll be doing as much drafting and sealed as I can between now and then. Today I’ll be looking at the colorless and artifact cards and while they are few, they are nonetheless exciting. My favorite non-rare Eldrazi would probably be Bane of Bala Ged. 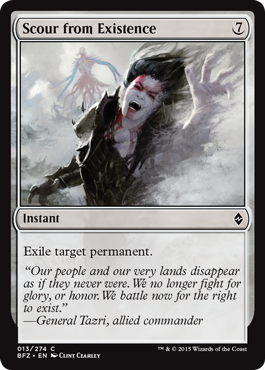 This is the closest card we’re going to get to “Annihilator” from the previous Rise of the Eldrazi set. If you’re looking for a top end beater then look no further. Even if it attacks once your opponent is losing 2 cards from the battlefield, and either using their best removal to take it out or blocking with their best creature(s). All Eldrazi will probably end the game in 2-3 turns if left unchecked, but none give you more advantage than this one. It’s only draw back is the 5 toughness which can be teamed up on rather easily. I’d take it as one of my first picks in draft. The great thing about colorless cards is that they fit in any deck! It’s hard to decided between Breaker of Armies and the 8/9 trampler, but I think this guy gives you better overall pressure. If your opponent is building up an army of Eldrazi Scions to swarm you next turn or if they are one Ally away from ending you, attacking with this will ruin their day. It will kill multiple creatures in a normal midrange deck, and even trade with any other Eldrazi (other than Ulamog of course). Not as high of a pick as Bane, but still a good card to have in your deck. 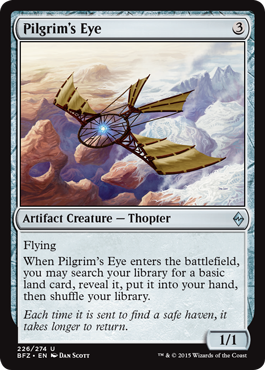 Eldrazi don’t fly, swim, or float in this set, but this guy at least tramples. If you have a 20/20 that keeps getting blocked by a 1/1 then what’s the point? Being able to push through all that damage is important, and that’s why I like Devastator. No other Eldrazi has evasion. Give me this guy over any colored beater at common. They should be quite common in limited so you should be able to grab at least 1 or 2. I don’t really think you need more than that. He’s a solid addition to any midrange deck, and doesn’t need any tricks to work. In a UG Eldrazi deck you could ramp into rather easily. You don’t really need anything special to make Kozilek’s Channeler work, and that’s just fine. The Channeler’s main goal is to ramp you from 6 mana on turn 6 to 8 mana, letting you cast just about 90% of the cards in the set. He’s great in decks with a decent number or Eldrazi, and also having a 4/4 body for 5 mana isn’t bad either. If you’re going for any deck OTHER than a fast Allies deck in limited, he’s a good pick up/play. I liked him a lot at the pre-release. Now we start to get into the tricky Eldrazi that have some special, conditional abilities. Deathless Behemoth is fine as a 6/6 with Vigilance that plays both defense and offense well, but what makes him better is how many Scion tokens you have. If you’re playing From Beyond and are pumping them out each turn or playing a U/G eldrazi deck heavy with token ramp, this guy will be great. He’s okay as a beater without the tokens, but to get the most out of him play the Behemoth in a UG Eldrazi deck. 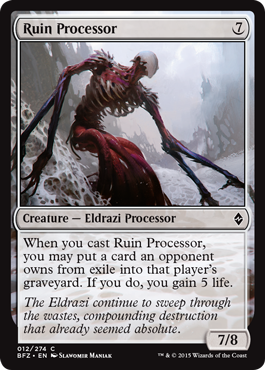 The “processor” Eldrazi are slightly more difficult to get full benefit from, but Ruin Processor still has a great body to work with (he must work out). He survives against a lot of his Eldrazi brethren such as Bane and Behemoth, and if you get that 5 life then great. He works best in decks playing a few of the Ingest Eldrazi, but can also us his ability if you exiled cards with Devoid burn or counter spells. Even a card like Stasis Snare would let you activate his ability. Keep that in mind while you’re looking for synergies. 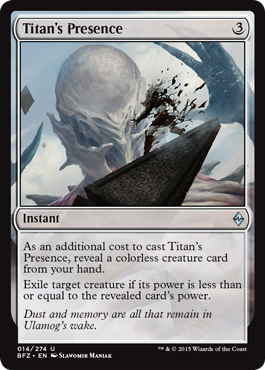 Value-wise the Despoiler is pretty good. He’s a 5/5 for 6 mana, and if you have been exiling your opponent’s cards he can enter as a 9/9. He’ll eat away at your opponent’s board every turn attacking for 9/9 and block a lot as well. The only time I wouldn’t play him is if I’m not playing enough exiling cards in my deck. Blue and Red usually have a good amount, as does black. I think he’d be a good choice in Grixis colors, but if your pool is mostly white and green stay away from him. If you get one of those pools with multiple Eldrazi, this card can be great. Having some Eldrazi in your deck + the From Beyond enchantment (search for an Eldrazi card and put it in your hand) means this can be pretty devastating. Grabbing a Desolation Twin means you can exile everything in the game, even Ulamog. It’s drawback is that you have to reveal a “colorless” creature card. Good in draft if you can build a multi-Eldrazi ramp deck, not so good if you only have a few in your sealed pool. Keep in mind that Devoid cards are also colorless creatures! You might snicker at how unplayble a 7 mana piece of removal is, but be warned how powerful this card is. If you’re getting beat down by a Lumbering Falls and can’t do anything about it, it’s gone (when it returns to being a land). If your opponent just hard cast a Ulamog, the Ceaseless Hunger sit back and relax, it’s “handled” (I know cause this happened me at the pre-release when I played my Ulamog . . .). It’s not something you want to be playing against quick decks like GR Landfall and Allies, but against other slower decks it can be a great way to get rid of their win condition. With all the Eldrazi at uncommon and common, having multiple ways to ramp into them is great, especially outside of green. 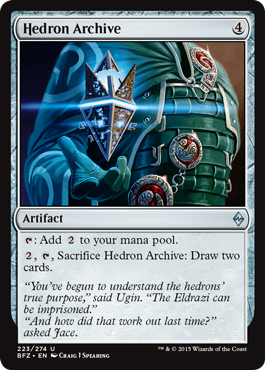 Hedron Archive gives non-green, non-Scion token heavy decks such as red, black, and white some ramp into heavier, late game spells. The secondary effect of drawing two cards when you sacrifice it is also pretty awesome. Card advantage and ramp in one. Grab it early in draft if you can. I’ve noticed that 3 color decks in this format are really strong, and that mana fixing is incredibly important if you want to do so. Blue gives you ramp tokens, but if you want to run color fixing you’ll need green cards like Beastcaller Savant, Lifespring Druid, and Natural Connection. Trust me, playing RUG, BUG, Jund, or Naya is much better than playing with just two of the colors. Pilgrim’s Eye gives you another layer or color fixing which is always welcome. If you’re drafting 3 colors and need that fixing grab it. Otherwise I don’t really think it’s needed in 2 color decks. Pathway of Arrows/Hedron Blade – I saw these played a lot during the pre-release in the lower curved Ally and Landfall decks. It gives your fast creatures more evasion and tends to take Eldrazi out of the situation. Slab Hammer – another equipment that I saw getting some play alongside the tap/enter the battlefield lands such as Looming Spires. Not a bad idea I guess. Today’s article was rather short and the last one will probably be rather short as well, but I’ll be sure to add in my pre-release report to the last one with what colors I used, decks I played, and what I learned from it all. As for colorless, all these Eldrazi cards were a blast to play with. Dueling it out with titans on both sides of the battlefield, changing the tempo of the game in one hit, it led for some thrilling matches (especially with the rare Eldrazi). I’m not sure if I evaluated these correctly, but if I didn’t I’m more than happy to hear what you have to say about these cards. Thanks for reading and check back soon for the final article: Multicolor and Lands!